Blood flow simulation in the brain on the basis of medical image data. The goal of the research project MEDVIS 3D, which is being carried out with the Kepler Universitätsklinikum (Med Campus III, formerly AKh Linz and Neuromed Campus, formerly LNK Wagner-Jauregg) is the development of a universal software tool for easy and fast reconstruction of aneurysms from medical image data (MR, CT, etc.). Based on the intensity data of these modalities, our software is able to reconstruct and directly visualize the acquired volume in 3D. The system marks areas that contain pathologically dilated vessels (aneurysms) and calculates various measures like diameters or volume. Inlet planes can be defined by the user through direct interaction; the system automatically reconstructs the vessel pathway between those planes. Thus, the software supports the diagnosis of aneurysms and allows a quantitative assessment of the therapy progress. Reconstructed 3D geometry data can be integrated into a computer simulation model. Using the Finite Element Method (FEM), the system can simulate the blood flow in the brain. The complex numerical solvers are accelerated by the Algebraic MultiGrid method (AMG), High Performance Computing (HPC) and modern GPU programming. 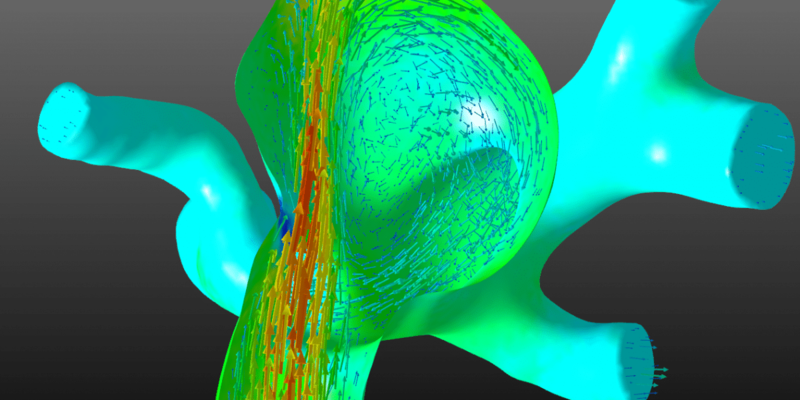 Depending on the complexity of the vessel structure, one simulation run takes anywhere from several minutes up to many hours. Our system can calculate velocity and pressure fields, as well as surface stresses at the vessel wall, and even determine the displacement of the vessel wall by the blood pulse. Thus, the risk of a rupture of the dilated vessel (hemorrhage), as well as adequate therapy measures, can be derived from the simulation results. The system is currently being evaluated together with medical experts in clinical routine and all results are being stored in a central database. This shall lead to a deeper understanding of the mechanical processes involved in the development and growth of aneurysms. Developed by the Medical Informatics research department of RISC Software GmbH, the software will be evaluated in clinical use and further developed with the leading centre in Upper Austria of The Kepler University Hospital. The research project is financed by the State of Upper Austria, GESPAG, AKH Linz GmbH and by funding from the FFG. A clinically usable version of MEDVIS 3D has existed since 2013 and is available for download on the website. Since 2016, we have been working together with the central radiology institute of the Kepler Universitätsklinikum and Mattes Medical Imaging GmbH on a prediction model for complications following endovascular care of aortic aneurysms (EVAR). Based on demographic and geometric data as well as the calculated blood flows at different times before and after the procedure, a prediction of typical complications (endo leaks) is to be taken. The project entitled EndoPredictor is funded by the State of Upper Austria as part of the Call Medizintechnik “Innovatives OÖ 2020” program.